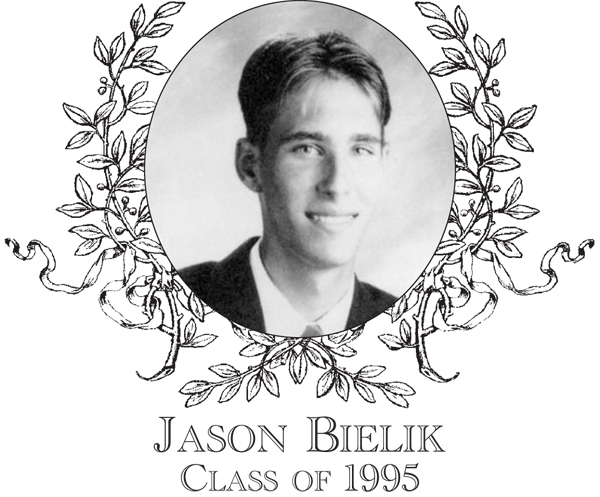 Jason Bielik, Class of 1995, was a two-sport athlete at Bartlett High School participating in both soccer in the fall and tennis in the spring. In soccer, Jason played fullback starting for the Indians both his junior and senior years. His intelligence and excellent instincts resulted in solid positional play in front of his goalie. Tennis was by far Jason�s top sport and, by all accounts, he was the top male tennis player ever to don the colors of the Green & White � by a large margin. Jason joined the tennis team in the eight-grade and became a permanent starter in his freshmen year. As a ninth grader, Jason played the number two singles position and recorded a record of 16-0. In his sophomore year he moved up to the first singles position and continued his amazing streak of undefeated play, facing many top upperclassmen. The junior and senior years were no different, with the phenomenal play and streak continuing. By the end of his senior year, Jason had compiled an amazing career record of 67-0 � Wow! It is highly unlikely that this extraordinary record may ever be matched by any future Bartlett tennis player! Jason was incredibly consistent in all phases of the game. He was an excellent server, had solid ground strokes from both the forehand and backhand sides, and used his long reach to his advantage when he approached the net. Despite all of Jason�s excellent tennis skills, the biggest factor in his incredible record was his unyielding determination. His never-quit and his never-give- in attitude often was the difference maker. Jason was a four-time Border Conference All-Star and was named a Worcester Telegram & Gazette All-Star in both his junior and senior years. In his junior year, Jason played a key role in leading the boys� tennis team to the District E Tournament title. Jason was an honor roll student and participated in a number of activities at school, with an especially strong interest in band. Jason graduated from UMass-Lowell with a degree in music and now heads the Music Department at North Middlesex Regional High School. He is the son of Jack and Pat Bielik and has a brother Matt.